It is always sad to see good food go to waste, especially when it is caused by poor handling, preparation or the wrong way of cooking. At times, we may find ourselves responsible for certain mistakes in the kitchen (I have had my own share of mistakes and learned from them the hard way). At other times, it may be our own household help who would not know any better. As to why this happens, many times, they are not given enough instructions. The bottom line: we all spend money on food, and everyone wants their return on investment in the form of good taste. The longganisa I had today was very dry. It had lost its flavorful oils, which was a real pity. How I wish I woke up earlier to guide our household helper on the proper way to cook it. So how does one cook it? The biggest mistake one can make–the mistake of the one who prepared it earlier — is to just fry it in oil. Yes, the longganisa comes out toasted. But it is too dry. You lose the real flavors of the longganisa, especially the garlicky variety. The best way to cook it is to pour about a cup of water onto your pan–non-stick is always preferred. Then you put in your longganisa. Allow the longganisa to simmer, rotating it regularly so that it each piece browns evenly. Notice, there is no need for oil. As the water evaporates, the juices and oils of the longganisa come out. It is these very delicious fluids that complete the cooking and make them very tasty. How much water? Aa cup will do. The idea is not to totally submerge the longganisa, which only prolongs the cooking time. So a cup is enough. For a more flavorful longganisa, I add two or three cloves of crushed garlic into the water, as well as pepper. No need for salt as the longganisa is salty on its own. 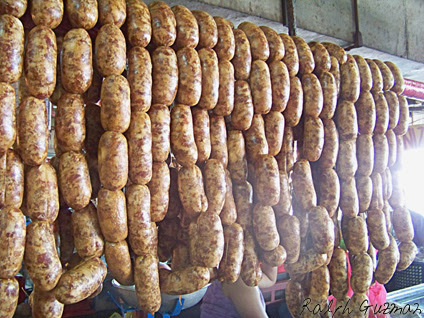 Once the longganisa has browned and is toasted, you can serve them. 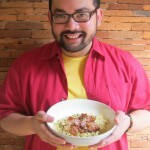 I love serving them with either scrambled eggs or salted eggs, as well as garlic rice. I also dip the longganisa in a bowl of vinegar, garlic, and salt. The vinegar from the Ilocos provinces, I feel, are the best partner to longganisa. Lest I forget, do not throw the oil of the longganisa right away. You can make good fried rice out of the longganisa oils. If you have a little oil left, you can add additional cooking oil. Add garlic. And then, add your rice. This entry was posted in A Foodie's Thoughts, Breakfast, Food + Recipes by Ralph. Bookmark the permalink. pero hindi ba mali rin yung 1 cup of water? kasi hindi rin naman consistent ang sizes ng frying pans. a good way to measure yung amount of water is to submerge yung longganiza sa water na 1 inch high?